I love pork tenderloin and it is often my main dish of choice for dinner parties. So far, I haven't met a preparation of this versatile cut of meat that I don't like: grilled, roasted, slow cooked, easy, more complex. There's not a bad apple in that bunch of recipes! And even though I have my favorite preparation methods and flavors, I love trying new things, too. This version, from Cooking Light, is absolutely delicious. The great thing about pork tenderloin, especially for dinner parties, is that it cooks relatively quickly, and you don't have to fuss much with it (maybe brushing with sauce once in a while but that's it!) leaving you available to do other things. It's also important that the meat rests for 5 minutes or so after being removed from the oven, which lets you put the finishing touches on side dishes. 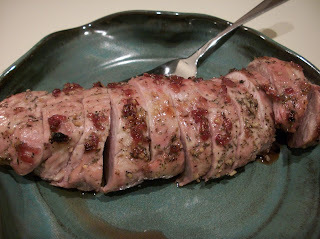 Pork tenderloin is great not only for dinner parties; it's great any night of the week whether you have company or not. 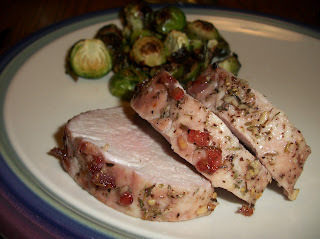 I oftentimes serve pork tenderloin with sweet potatoes or garlic mashed, and some variety of brussels sprouts or green beans. Cranberry salad or sauce is also a great addition! Find more great stuff at Full Plate, Wow Me, Showcase Your Talent, Wow Us, What's Cooking, Foodie Friday, Friday Frenzy. Combine salt, pepper, 1 tsp. oil, thyme and garlic; rub over pork. Place pork on a jelly roll pan coated with cooking spray; bake at 500 for 10 minutes. Combine remaining 1 tsp. oil, grape jelly, vinegar and onions in a small saucepan; bring to a boil. Cook 1 minute, stirring occasionally. Brush half of jelly mixture over pork; bake for 5 more minutes. Turn pork, brush with remaining jelly mixture. Bake 5-8 minutes or until a thermometer registers 145 degrees. Place pork on cutting board; let stand 5 minutes. Slice and serve. Serves 3-4. 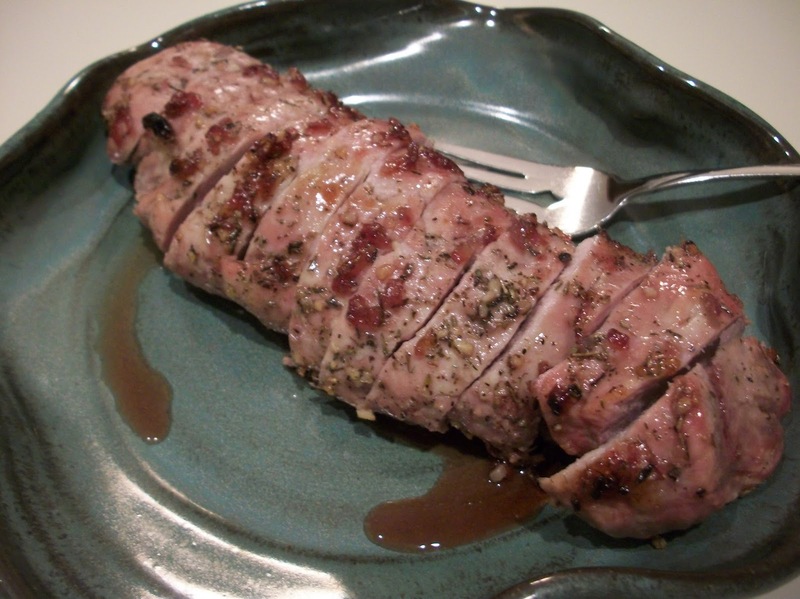 Your Pork Tenderloin looks amazing! Hope you are having a great day and thanks so much for sharing with Full Plate Thursday.